Rugged devices designed for war, or at least for warlike conditions, in the past rarely made it out of very specialized markets. Often, they were slower and yet more expensive than their civilian counterparts. That disparity, however, is changing. In fact, a lot of things in the rugged market are in flux, and that's a good thing both for those needing the specialized devices and for those who merely would like to have them. This year, our call for rugged devices netted quite a haul, as the rugged market diversifies and aims at people other than Special Forces commandos. We tested a notebook PC, a tablet PC, two cell phones and a rugged server. It is difficult to tell just by looking at them that the server and the cell phones are, in fact, ruggedized against all kinds of forces that would destroy a normal system. And the notebook and tablet hold a few surprises as well. All systems were tested in the GCN Lab to 810f military specifications (if they were rated as such) for shock, heat and moisture. To see how we tested these products in graphic detail, please view our 'Rugged computing' slideshow at GCN.com/723. Panasonic was also invited to participate but was unable to get a Toughbook notebook to the lab by our deadline. When we heard that DRS Tactical Systems had created a rugged tablet computer called the Hammerhead Xtreme, we were skeptical. After all, a slate-type tablet computer has no cover to close. The big display that is so helpful when moving icons around the screen, taking notes or using innovative tablet functions is like a piece of bread spread liberally with jelly'seemingly aching to splat face-first onto the carpet. In our testing, there is no carpet of course, just 810f-specified concrete overlaid with a sheet of plywood. We predicted that the tablet would shatter into a million pieces when we got to the part of the test where it was dropped screen-first. But the Hammerhead is tougher than it looks. In addition to the milled-aluminum case common to most rugged devices, the tablet also has a foam shell molded to the outside of the tablet. Besides making the unit much easier to grip, the shock-absorbing material helps protect vulnerable areas, including the display. For shock ruggedness, the Xtreme gets an A. Starting at just 10 inches, we dropped the Xtreme onto each of its six surfaces and all eight corners. After each drop, the unit was checked to verify that it was still working properly, and any damage was recorded. Then we moved up to 20 inches and eventually a towering 30 inches above the board. Military specifications call for even-higher drops, but they allow a company to use up to five notebooks, with each one tag-teaming the next should it begin to fail. Since we only had one of each product, we set 30 inches as the maximum height of our testing. We probably need not have worried about the Hammerhead. The hard case held the components in place, and the shock-absorbing foam almost negated any bounce. The Hammerhead kind of stuck in place, especially when dropped along one of its flat surfaces. No matter how far the Hammerhead falls, there is a very good chance of unit survival'way better than with any other tablet system we have tested. While we suspect we could have used the Hammerhead to drive nails into our test board, it did not fare as well in our hostile-environment tests. The unit performed adequately at 110 degrees Fahrenheit and near 100 percent humidity, but two things made it a little uncomfortable to use. First, the unit is black instead of the gray or silver metallic more popular on rugged units today. Color choice is more than a fashion statement. The lighter colors reflect more heat, while black absorbs it. When the Hammerhead was removed from our 'rain forest' environment, it was uncomfortably hot to the touch, whereas the lighter-colored units were cool. This did not apparently hurt the unit, but absorbing more heat will harm it eventually, and more quickly than others that are lighter colored. And user comfort is important as well. Long exposure to moisture could also be a problem. For our tests, we used a boiling-water humidifier, which causes water vapor to stick to things. The Hammerhead's foam covering absorbed water like a sponge. Perhaps this was intentional, as the cool water helped soothe our fingers after touching the hot metal, but in constantly moist environments it might eventually offer bacteria a home. One final downside: The Hammerhead Xtreme exhibited very poor processor performance. It only scored 3,841 on the GCN/Alterion benchmarks, less than half what a modern notebook or even a second-generation tablet should achieve. With a government price of $3,813, the Hammerhead is a little expensive, but perfect when shock is a primary concern. The new Itronix GoBook XR-1 takes to water like the proverbial duck. It is perfect where constant rain'or even mud and wet grime'is an issue. The XR-1 came out of our GCN rain forest environment seemingly none the worse for its three-hour, 110-degree steam bath. In fact, it emerged from the chamber completely cool to the touch even though it was running the entire time. The condensation on the screen was easily wiped off with a bare hand, and the system continued to perform as quickly as its 1.83-GHz Core Duo processor could run, which was extremely fast. Moisture is not really an issue for the XR-1, which seems ideally suited for a marine biologist or perhaps even an intelligent dolphin. Short of full immersion, you can't really hurt the XR-1 with water. 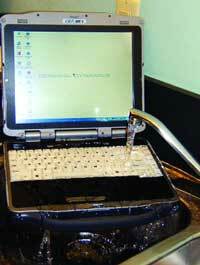 To test this, we actually set up a sink to run water full blast onto the keyboard. Water poured across the keys, forming a miniature waterfall that ran for over five minutes with the unit powered. At the end of the test, we simply dumped out the water, and the XR-1 continued to run without ever shutting down or showing any ill effects from its soaking. Don't try that at home with a normal notebook. While we were pleased with the XR-1's ability to withstand water and heat, we were slightly disappointed with its shock resistance. Two minor glitches marred the unit's performance. The first occurred right after we began drop testing at 20 inches. When the unit was dropped onto the surface with the integrated carrying handle, the plastic case split open and a one-inch chunk of handle flew off. The missing piece made the handle less sturdy but did not affect operation of the unit. The other shock-testing problem happened when the unit was dropped from 30 inches. About half the time, and especially when the unit was oriented with the back facing down, the shock dislodged the battery for an instant, shutting down the unit and forcing a re-boot. Performance:-wise, the XR-1 hit 8,227 on the GCN/Alterion benchmark. Although not quite the level of a bleeding-edge notebook, that score puts it in the first tier in terms of performance. It has a lot of extras such as slots for connectivity to WANs and LANs, Bluetooth-enabled devices and Global Positioning System radios, all of which can operate at the same time. The keyboard also glows a bright green, which can be handy in case of a power outage. The glow can keep you typing for about thirty minutes before it fades. Despite the minor problems with shock, the XR-1 with a $4,330 price tag is perfect for people who need performance and ruggedness, especially where rain, water and moisture are primary concerns. The Verizon G'zOne Type V may sound like some creature from the Dungeon and Dragons monster manual, but it looks surprisingly like a regular phone. Having used rugged phones before in such inhospitable places as the Mojave Desert, we were expecting something about the size of a brick and nearly as heavy. The little G'zOne flip phone with its tiny 4.1-inch size and 5.3-ounce weight, however, looks like a normal phone. There is even a stylish circular window that shows the time when idle and will let you know who is calling. There are a good many extra features. The little camera that is pretty much standard with phones these days is actually 2.0 megapixels. This provides some really good images and even lets you record and send video messages up to 15 seconds long. And the phone will store up to 500 contacts in a fairly extensive database. On the negative side, the speakerphone is not very loud at all. We did the heat and moisture testing first because we were really worried about the large display cracking during the drop testing. The G'zOne Type V was seemingly unaffected by heat and moisture, connecting a call right after coming out of the chamber. It turns out that we should not have worried about drop testing. The window we thought would give so much trouble is actually recessed into the case a bit, so it never is subject to a direct blow when the phone hits the ground. Unlike the i580, the G'zOne Type V does not seem to have a rugged coating but is, in fact, protected by a polymer that looks like normal phone material. One odd feature is a little plastic bar that sticks out the bottom of the phone like a roll bar on an off-road car. This addition makes the phone not just rugged but what we would call super-rugged when dropped with the bottom straight down. We don't know if this extra protection was added to shield a vulnerable area or because most dropped phones hit this way, but the result is that the G'zOne Type V takes on a bit of a superball quality when it hits. From a 30-inch drop, the unit shoots back up eight inches on a very strong bounce. When it hits at other angles, this is not the case. The one minor quibble with the G'zOne Type V is that when the front hits the ground first, the phone pops wide open, potentially exposing the unit to additional damage. Tightening the hinge a little would probably prevent this, but no damage was recorded to the phone in our tests. The price of the phone is just $299, though this requires a two-year contact with Verizon. Despite the cost of the service contract, you can figure the $299 works out to about $12 a month, which is more than reasonable for a rugged phone that does not look like one. The Sprint/Nextel i580 is nearly indistinguishable in appearance from any number of the Nextel flip phones that were popular before the companies merged. Close inspection of the i580, however, reveals that the grayish-black material surrounding the phone is actually a rubberized polymer. This not only gives you a solid grip on the phone but also absorbs a lot of the shock from a drop, should you somehow lose your grip. The i580 has a lot of extra features, including a really nice loudspeaker that is way more functional than the one from Verizon (see review at left). You could use the quality speakerphone on the i580 in hands-free mode without having to purchase a headset. Just set the phone beside you in the car and talk away. In our tests, very few people could even tell we were talking on a speakerphone. In terms of heat and moisture, the i580 came through with flying colors. Neither seemed to harm operation at all. When it came to drop testing, the i580 smacked the ground like a brick with almost no bounce at all, even from the 30-inch top of the testing cycle. This is a real testament to the shock-absorbing characteristics of the thin rubber coating that covers most of the phone, including around the antenna. The price of the i580 is a bit of a mixed bag. The list price is $429. Currently, there is an instant discount that takes off $150, which makes the final cost $279. At $279, it's not a bad deal. There is no guarantee that the instant discount will last forever, though, and $429 is a bit high, considering that another rugged phone in this review is priced a lot less. When Crystal Group called and wanted to submit a server for our yearly look at rugged computers, we were a bit taken aback. Servers are normally put into climate-controlled, power-protected data centers, right? Well, not always. Some are actually put into the backs of military vehicles or airplanes, where shock and vibration can be killers. Since this type of server generally is going to be more of a dedicated appliance than a high-end unit, it will offer relatively modest performance. The unit we tested had a 3-GHz Xeon 64-bit processor and 4GB of RAM. This server configuration is called the RS112-SX and carries a government price of $4,823. We did not test the RS112-SX for moisture because it is rated for noncondensing humidity, and our humidity test is very much condensing. We did put it through modified tests for shock, though. In addition to being certified for 810f shock, the RS112-SX is also rated for MIL-STD-167-1, which sets survivability rates in terms of vibration. Since the unit is likely destined for a vehicle of some type, we took ours into one, setting up a makeshift network in the back of a Jeep Wrangler 4x4 SE. The server is powered by a TrippLite rackmount battery, which in turn constantly charges off the vehicle's battery. Since off-road travel would be too rough on the standard SATA Western Digital Raptor drives that comes with the server, we replaced it with two 8GB SATA solid state drives that were mounted in Crystal developed drive carriers. We mounted everything on a mini-rack, which sat in the back with the seats down. We ran the GCN benchmarks on the RS112-SX while driving over the roughest dirt tracks we could find. After that, we drove through a very bumpy cornfield. Amazingly, the unit kept running the benchmarks the entire time. Back in the lab, we also ran the RS112-SX through the heat chamber without moisture. The unit is rated up to 131 degrees and performed well for three hours in the 110-degree heat.